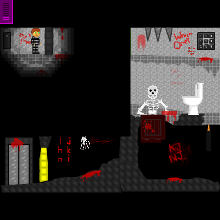 THIS IS THE LONGEST I'VE WORKED ON A GAME D: And this is all I got done, so I decided to release it as a demo first! HOW TO PLAY: ASWD/Arrow keys. You need to follow clues and unlock doors ETC to escape an asylum. I'll make the storyline later. Sometimes you need to drag the levers to open doors or click on the numbers to break codes, etc. You need to explore to find your way, there's no easy way out! Prepare for pop-up scares and watch out for obstacles!